A photo from 1910, taken from the old water tower. It's a great old bay view with only a few houses - including two built by George Erbe, the Whelen Inn and the old railroad bridge that brought the West Jersey/Pennsy train through Strathmere. The West Jersey train station was near the West Jersey Cottage. Click image for larger view. Below is another great shot taken from the water tower, from 1910. 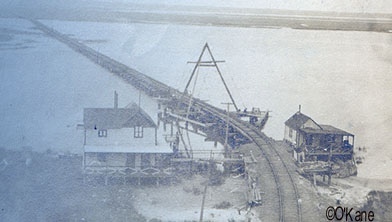 This shows the Reading Railroad bridge coming across the bay into Strathmere. To the left is the Stevens house and on the right is the bridge tender's house. This bridge was removed near the end of the 1920s. It used to come into town right about where Twistie's stands now. Click image for larger view. 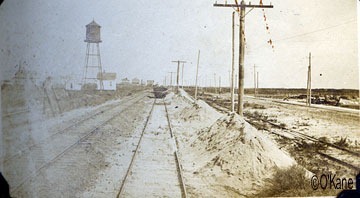 Excellent 1910 photo from the center of the island looking north . 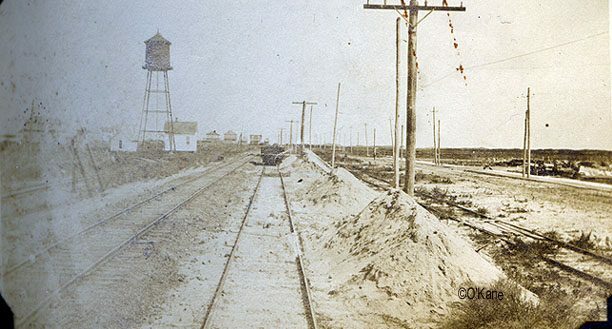 Click on the image for a larger view and you can see both sets of railroad tracks and on the far right is the track for the trolley that used to run from Strathmere to Sea Isle City. There's that old water tower again. From 1915, Mrs. McCullough & Mr. Speakman stand in front of the concrete house that used to stand on the end of Sumner. The house was one of several built by Gilbert Smith.The house behind it to the left is on Tecumseh, and it was another of his houses. This house was torn down for new construction in 2005. Below is another Gilbert Smith concrete house, this one used to stand near the end of Sherman and it later collapsed on the beach. 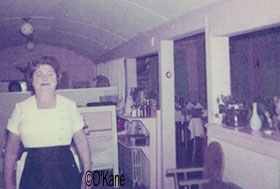 Mrs. McCullough is on the porch and the very old water tower can be seen just to the left of the house, in the background. 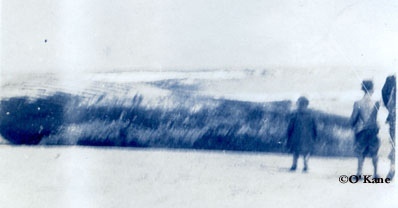 On the bay, looking north with the PRR bridge in the background, near the West Jersey Cottages.The photo was taken around 1915 and it appears to be Mrs. McCullough and an unidentified man. Click image for larger view. A blurry photo of a whale on Strathmere beach. 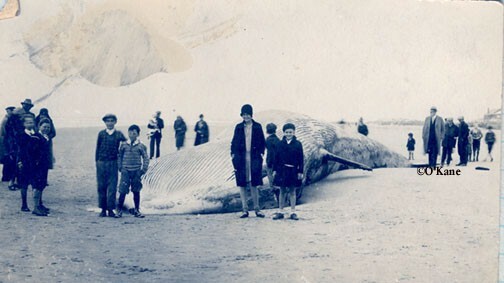 Another whale on the beach in Strathmere, dated 1929. It may be the same whale from the first photo. 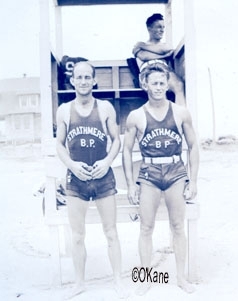 From 1930 - Strathmere's first lifeguard Johnny Trainor (right) and fellow lifeguard Al McCullough. Unidentified man in the stand. 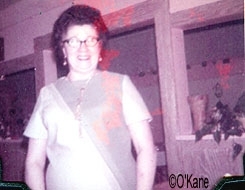 The following group of photos were taken in Mildred's Restaurant in the 1960s. 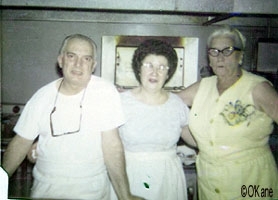 Delphine McCullough Quinn kept the books for Mildred's from the time she first opened. 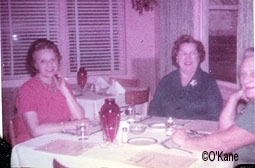 From left - waitress Alma Sinnot, middle photo is Mildred herself in the kitchen, last photo is Charley, Mildred & Phyllis. 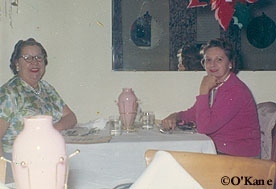 From 1963 - Florrie Andress & Beulah Nelson having dinner. 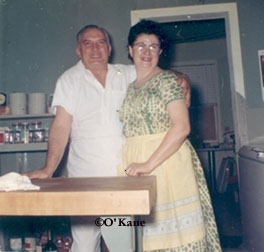 Mildred & Charley Conasenta. 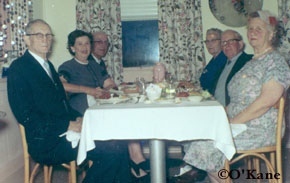 Last photo shows the McCanns, the Quinns and the Stricklands enjoying a holiday dinner at Mildred's Restaurant. 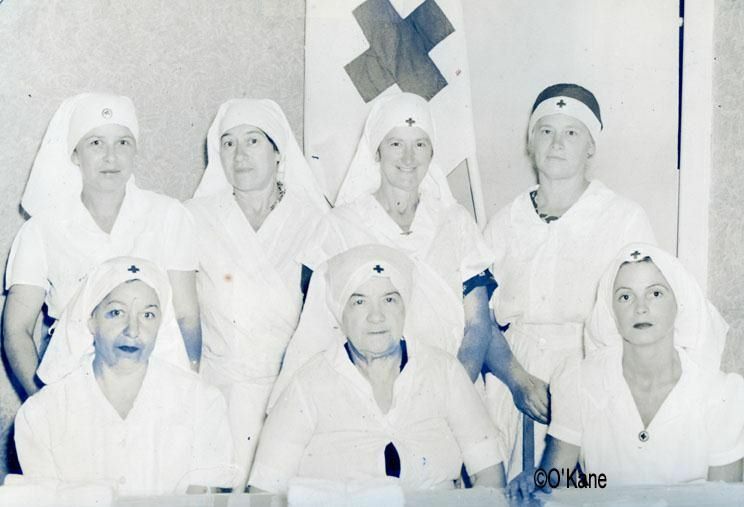 Photos were donated to this site by Pete O'Kane & family. All images on this page are Copyright ©Pete O'Kane courtesy of www.strathmere.net.